Alzheimer’s disease is difficult diagnosis for seniors and their loved ones. In the past, Alzheimer’s was often diagnosed only after the brain was already significantly impaired. As care for Alzheimer’s is evolving, so are diagnostic tools. New methods can potentially detect the disease sooner—perhaps even before symptoms of mental decline show up. Home Care Assistance, a trusted provider of Alzheimer’s care in Harrisburg, discusses three new methods for early detection. Brain imaging tests remain the top diagnostic tool for Alzheimer’s, and such methods continue to evolve, catching the condition earlier and earlier. 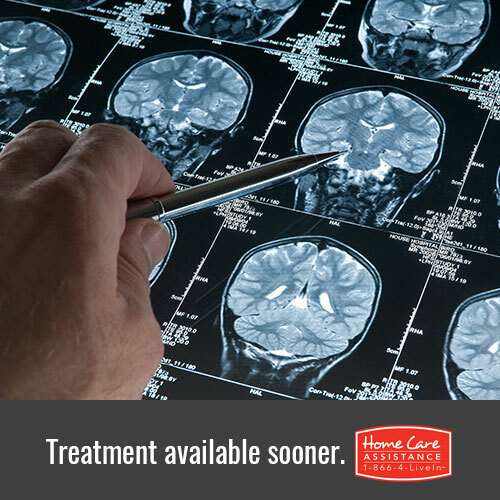 Diagnosis usually requires both computed tomography (CT) and magnetic resonance imaging (MRI) scans to detect changes in the brain. A newer method may also detect the presence of amyloids in the brain much sooner, thanks to the development of florbetapir F-18, a tracer used in positron emission tomography (PET) scans. Other new tracers include flutametamol F-18 and florbetaben F-18. Early Alzheimer’s detection can also involve more detailed blood and fluid tests. These tools look specifically for body proteins that can indicate disease development. Among the most commonly detected proteins are beta-amyloid from the blood, and tau from cerebrospinal fluid found during a spinal tap. Looking for biological signs of Alzheimer’s disease risk may also help. Biomarkers, such as beta-amyloid, which a blood test may be able to detect, can indicate the development of the disease. Genetic testing may also help detect the presence of the gene APOE-e4, which is strongly linked to Alzheimer’s. It’s important to note that both of these testing methods are still undergoing clinical trials, and are not available to the general public yet. Despite the advances in diagnosis and treatments, there is currently no cure for Alzheimer’s. Still, an early diagnosis ensures timely care for your senior loved one, as well as improved quality of life. Discuss Alzheimer’s testing with your loved one if you have concerns. Learn more about how Alzheimer’s can affect seniors by reaching out to Harrisburg home care provider, Home Care Assistance. We proudly offer hourly and live-in home care for seniors, and our trained caregivers can help with a wide range of daily responsibilities. Call (7171) 540-4663 to schedule a free in-home consolation with one of our experienced Care Managers.